In celebration of getting started on my job, I decided to try some tea from a unique tea-seller: Hobbit Tea. They sell a small selection (only 3 varieties) of teas themed around The Hobbit by J.R.R. Tolkien. I decided to try the “Bilbo Baggins Breakfast Blend” and “Gandalf the Grey Tea”. The former is a blend of black tea, orange zest, red clover, cinnamon, and natural orange extract; the latter is mixed of chamomile flowers and Red Bush tea (Rooibis). 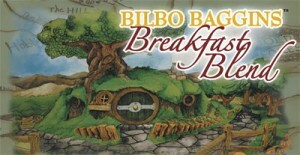 The Bilbo Baggins Breakfast Blend. The Breakfast Blend turned out to have a pleasant, warm flavour. Just what one would want for a morning. The orange and cinnamon go very well together, I always thought those were two complementary tastes to begin with. This one was also a big hit with the younger siblings due to its spicy and exotic taste. 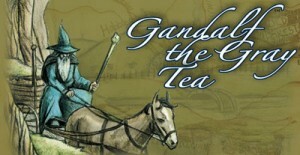 The Gandalf the Grey Tea was also delightful. Chamomile is traditionally brewed as a tea to help with sleep. Red Bush tea is a variety found in South Africa and has a sweet, slightly nutty flavour. Both are often served sweetened with honey or lemon. I fairly certain this is meant to be a relaxing and calming tea; Chamomile being used for sleeping and Rooibus to assist with nervousness and digestion.